This really great site linked me immediately to lots of people all over the world.. I had some pretty big dreams, you know – the explorer going up Mount Everest, the Astronauts and so on. However, I began small…. I set up the school Skype account, and then tested it on locally. The school has iPads, and I used those. I made sure not to leave the app logged in on the pupil iPads however. In fact, I got the Digital Leaders to remove the app from some of the iPads. Then we set up a Skype date – a school in Qatar, and a teacher who contacted me initially over twitter. We decided to set a theme – and as World Book Day was looming we went for a Book theme. Our Year 4 class was primed to talk about their book, and the teacher in Abu Dhabi, UAE prepped their children for their talk. Once connected the debate was quickly lead by the children. Their excitement could felt in the room! We had to rehearse some questions and the children could, some of the time, stick to a script! However, with a class of 30, it was tough for them to do. It was nice to let them lead the questions though – and this was helped by having the skype display on the interactive whiteboard through AirServer. This led then to the Digital Leaders writing up the experience for the parents and teachers to see. See our school website here. The children and teacher are now sufficiently motivated to read the book they were reading and report back at the next chat. The one session has been enough to make other staff ‘think big’ – and I am busy setting up other skype meetings! We have had some ‘dodgy’ connections with one of our other classrooms… Have a back up plan! I have been inundated with schools – don’t bite off more than you can chew! I was amazed at how many schools want to give this a go. Think about the time difference – sounds silly, but it has a real impact on what is possible. For the main skype session I prefer a fixed webcam and microphone rather than an iPad – the connection feels so much more solid! The motivation for writing, speak and listening are obvious… the children are able to see a purpose to what they are doing. Speaking and Listening – sharing ideas and crossing a language barrier! Topic based work? Specific and shared learning intentions? Sharing teachers? 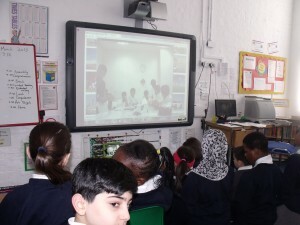 Skype in the Classroom – a good place to start! An Author in Every Classroom – Messner, Kate (2010) School Library Journal – abstract – This article discusses how Skype and other video-conferencing software have become a staple for teachers, librarians, and authors who want to get kids excited about reading. The past year has brought a huge increase in the number of schools and libraries using Skype to connect classrooms and bring in experts to talk with kids. And with cuts in school funding limiting traditional author visits, meetups via Skype have grown even more popular. All of the authors interviewed in this article agree on one point: it’s important for teachers and librarians to prepare students for a Skype visit in advance. Reading at least one of the author’s books, either together or as a read-aloud, is a must, and kids who prepare questions in advance are generally more comfortable speaking on the day of the visit. Posted by RS on March 20, 2013 in iPad, Literacy and tagged classroom, Reading, Skype, speaking and listening.